Bring a feel of the outdoors into your living space with this gorgeous set of wall mounted butterflies. The Umbra Mariposa Wall Décor set of 9 butterflies is a great way to set your interior apart from the norm, by introducing playful and dynamic art onto a surface usually ignored. 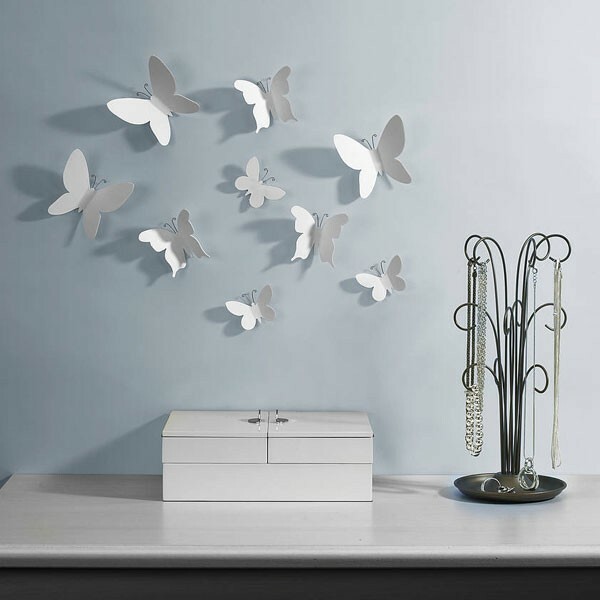 Position your very own swarm of butterflies above a side table, or have them flying up and across one of your larger feature walls: you will be amazed at how these wall mounted butterflies can instantly transform your interior! Superb! Very cute! Great service, great products! Looks fab on our daughter's wall, exactly like the pic. Beautiful accessories for our hallway. Arrived quickly and well packaged. Very pleased. Very pleased with the product purchased will visit again. Easy to fit and well made.